Preheat the grill to high. Cook the pasta in boiling salted water, according to the packet instructions. Drain quickly, allowing some water to cling to the pasta, and return to the hot pan. Stir in the grated courgette, crème fraîche, nutmeg, mozzarella and half the parmesan; season. 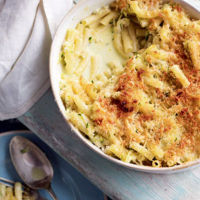 Tip into an ovenproof dish and scatter with the breadcrumbs and remaining parmesan. Grill for 5 minutes, until golden and crisp.